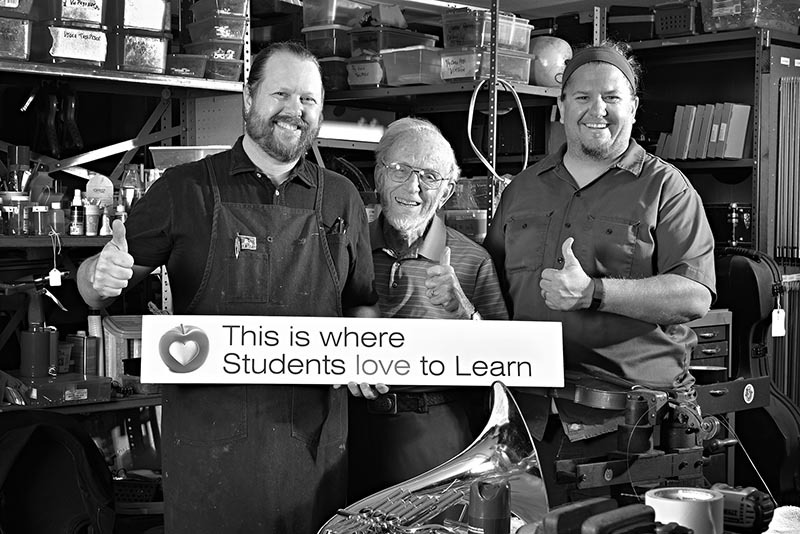 "The Tucson Unified School District Musical Instrument repair team works directly with our music teaching staff to bring well working and maintained instruments to students free of charge. With over 10,000 instruments in rotation, from kindergarten general music items to high school marching band needs, this shop can do it all. With help from long-time volunteer Dr. Ned Bloomfield who has worked on orchestral repairs for the last 17 years and employee Joel Dunst who rounds out the knowledge of this shop for percussion, brass and woodwind repairs, we plan to expand shop services in the future. This team has worked so well together for so long that some days, it does not feel like a job because we know the work is going to help students in their fine arts experience." Sean Randel: Love working on instruments exclusively for the kids of TUSD. Sometimes it does not feel like a job when you hear the music. Dr. Ned Bloomfield: As a retired physician, the work in the shop does more for me than I do for the school district. Joel Dunst: I love being able to give students the opportunity to play a musical instrument.